Voltron: Legendary Defender’s third season was a rather serious affair, as it delved into new threats to the galaxy and some revealing lore about it’s universe. But despite that, it seems like the next batch of episodes will have some time for lighter moments, if this wonderful exclusive clip is anything to go by. 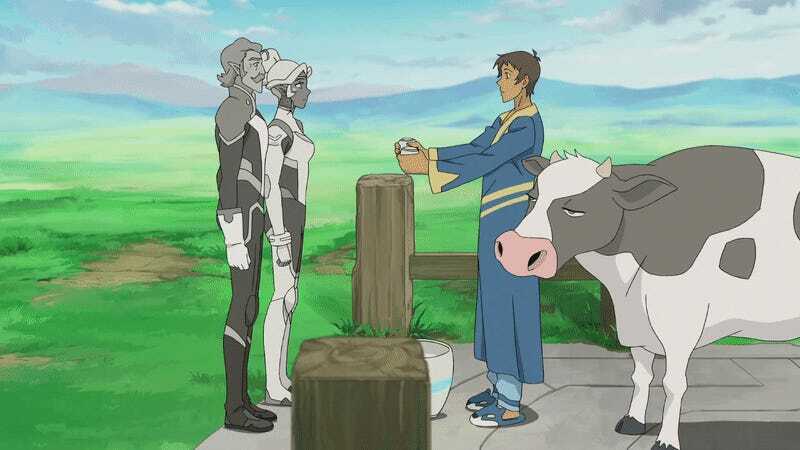 io9 is delighted to present this clip from the upcoming fourth season—which is really a continuation of the show’s third, split into two smaller seasons as part of a new release schedule—which casts aside all those big questions we had at the end of season three in favor of asking what is probably a much more important question on Coran and Allura’s minds: where do milkshakes come from? It’s a brilliantly silly sequence—and gorgeously animated too, between the retro pixel art for Lance’s video game and then Coran and Allura’s over-reacting to how you actually acquire milk—that the third season didn’t really have much time for while it set up its weightier arcs and storylines. Hopefully, there’s more where this came from when all six episodes of Voltron: Legendary Defender’s fourth season hit Netflix this Friday, October 13.